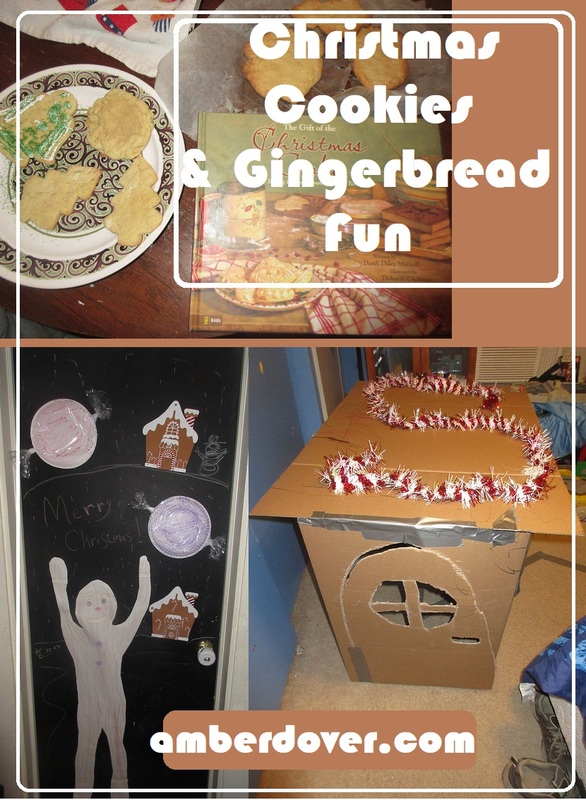 In this post: Crafts, food, and fun with cookies and gingerbread! Hello, Dear Ones! We are nearing the end of our Christmas posts. Baking is a big part of the holidays. Whether it’s decorating cookies or making a gingerbread house, baking brings families together. Here is how my family made baking magic! Enjoy! Salt dough cookie play- We used our salt dough ornaments for cookie play. I have several Christmas tins for play. Michael and I baked cookies while Leeland played. I read “The Gift of the Christmas Cookie” to the kids. We put together gingerbread houses as a family. Leeland liked eating all the candies! I read Mortimer’s Christmas Manger. You can learn about this book at the link above too. The boys made a Gingerbread playhouse from cardboard. Leeland learned ABC’s with these Gingerbread matching cards. You can find them here. We stuck to the first six letters. Remember the felt gingerbread playset I made? We still have fun with it. Candy Land on the Chalkboard door! I made a life-size Gingerbread man by tracing Leeland. The candies are paper plates and plastic wrap. We got the foam gingerbread crafts from Hobby Lobby.